Direct translate from Dutch: In 1994 there were 1.8 million pictures of the moon during the ‘Clementine mission.Several variations were shot, including full color photos. On the cover of the DVD is one of the hundreds of pictures that you see presented in the film. This is the first time in human history that the full moon in its natural color is revealed. 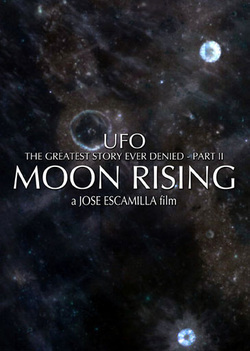 Leaving aside whether we have been to the moon or not … We have no doubt landed.This film is about what awaited us when we arrived and the lies that have been put in motion for what was, to conceal. The researchers in this movie are speaking, tell us about the facts that more than forty years before were hidden. These facts will surprise and shock at the same time. You’ll ask yourself why these lies so long been presented to us. The answers to these questions show that we are not treated as equals by those who pull the strings in this “greatest discovery ever denied. Hiding the evidence that civilization may have been on the moon, or even more incredible, the possibility that they are still there, does raise questions about why we do that are kept in the dark. The greatest invective that made us believe that the moon was a gray, colorless rock. By contrast, the moon more like a small planet teeming with life and structures of the type you get, until now, never seen before. It seems in any case strongly suggest that the Moon was inhabited in 1994 when these pictures were taken. On the DVD cover shows a top right bright silver-blue colored disc with a light green dome in the middle. Compared to the ground below, it does not match the angle of the surface. The object floats above it, on its side. The other disc at the base is correctly positioned on the lunar surface and illuminates the surrounding area.